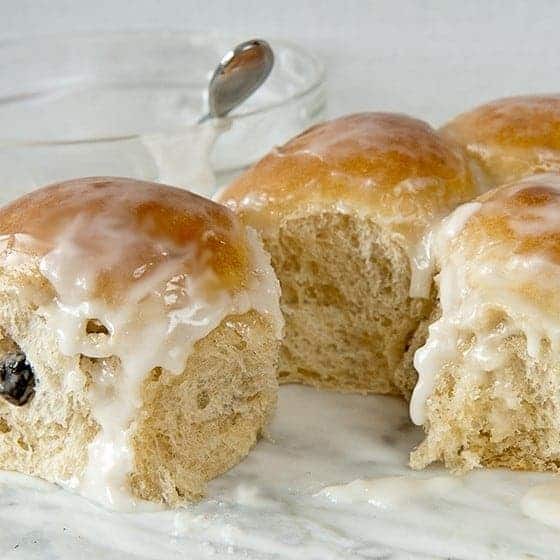 My favorite dinner roll recipe gets a makeover to produce these Sweet Rum-Raisin Yeast Rolls. Rum-flavored icing and raisins are the stars of the show. 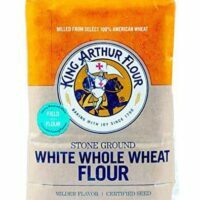 Like most of my bread recipes, you can mix this by hand or with a stand mixer if you don’t have a bread machine. Instructions here. My love affair with rum flavoring goes back to butter rum life savers. Remember those? I guess they’re still around but I haven’t had any for years. When I saw a recipe titled Rum Buns in one of my most food-stained and dog-eared cookbooks, Helen Corbitt’s Cookbook, I was inspired. Her recipe uses a brioche-type dough but I wanted something a little easier. I think ball-shapes are the fastest and easiest way to shape these rolls. If you haven’t seen it before, here’s a slightly dorky video I made to show you my simple technique. Get out your bread machine to make these fluffy and light rolls flavored with rum or rum extract and raisins. 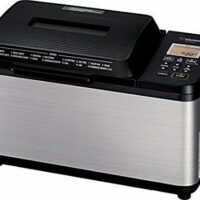 Add all ingredients but raisins to bread machine pan in order listed. Select dough cycle. Check dough after 10 minutes. Add flour or milk, as appropriate, 1 tablespoon at a time to make dough stick to the side of the pan and then pull away as it kneads. When dough cycle completes, remove dough from pan and place on floured surfaced. Knead raisins into dough. Divide dough into 16 equally-sized pieces and form into smooth balls. Place in 2 greased 8 or 9-inch round pans (preferably with a dark finish). Lightly cover pans with a tea towel and allow dough to rise until almost double. Bake in oven preheated to 375 degrees for 10-12 minutes. Allow to rest 5 minutes. Remove rolls from pan and allow to cool on a rack unless you want to eat them right away. You have my permission. Combine all ingredients, stirring until smooth. Pour over slightly cooled rolls. Paula. I want to try and make these but I’m wondering if it matters that I don’t use bread machine yeast? 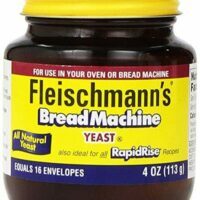 Bread machine yeast is a slightly more concentrated form of regular yeast so you may substitute. I would use a touch more regular yeast than the recipe calls for. Wonderful looking rolls Paula. The colour and consistency of them remind me of the hot-cross buns we used to have at Easter every year when I was a kid. You could use it where a zest or an extract is called for. It’s my understanding that the oils are much stronger than an extract (I have not used them before), so I’d be a little stingy with how much you use until you’re used to it. I use to love those life savers. These roils sound delightful! I’ve never used orange or lemon oil. What else do you use the oils in? I guess anywhere a zest is called for, huh? I want to make these and wonder if this would be a good time to use the raisins I soaked in rum? I read somewhere, about a month ago, it was an old trick to give flavor to hard petrified raisins and I set them to soak, but have not found a use for them. I’m not familiar with the oils and don’t know if it would work. Suzanne, I’m thinking I would like the mushroom gravy stuff even better. Love mushrooms and anything with mushroom flavor. These rolls look soft and fragrant and wonderful. I am intrigued by your use of citrus oil to add flavor to the raisins. I have never thought of doing that and would like to try it. Is that something you’ve done before? Or was the use of the oil on raisins kind of an experiment? I’ve done things before like soaking raisins in orange juice, or in a diluted liqueur, before draining them and using them in a recipe but I’m always on the look-out for new ideas like yours. A very interesting technique! Well these are a must try…I’m sure they’ll be fantastic since everything other bread recipe of yours has been. But just curious – is there a reason to knead the raisins in afterwards rather than during the bread machine knead cycle? Oh.my.goodness. These look divine! I use orange oil, too, for different things. Love it! These look amazing and I love the combination of flavors. Up North I was able to buy Sun Maid’s “baking raisins” which I loved for recipes. They were tender, plump and juicy. Can’t find them here in the South for some reason. These certainly beat “hot cross buns” anyday! I wonder why my heart smiles when I see you have a new post… could it be that you always share such tasty treats! Orange and lemon oil are new ingredients to me. Isn’t it amazing what wonderful variations you can make when you have a great basic bread dough. Dough correction: 3 tablespoons SUGAR!